Innovations For Persuasive Digital Storytelling. No one gets it right the first time. It’s how fast we learn and adapt that matters. DemLabs partners with campaigns to innovate better ways of digital persuasion. Following is the process we use, lessons from 2018 campaigns and two new apps. There are also details on an upcoming workshop where you can learn more about these projects from the teams responsible. We analyzed a video by Nathan Matthis protesting Roy Moore before the Alabama election. This video wasn't slickly produced, but it makes a persuasive appeal and has been seen over 5 million times. An idea emerged: how could campaigns systematically collect videos from their supporters to persuade others? Traditional video recording methods were too slow, expensive and cumbersome for many campaigns. DemLabs evaluated different video collection apps and chose Flipgrid. This free app was originally designed for education, but works just as well for politics. It's easy to use and has over 25 million users. Videos can be recorded from either phones or laptops and are immediately sent to the campaign. (Tip: Progressive groups benefit from re-using existing business apps rather than spending time and money on re-inventing apps that will soon be out-of-date). Collect community voices on video to build support for your cause. 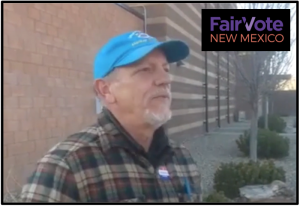 The opportunity to test Flipgrid in a real campaign arose with FairVote in Santa Fe, New Mexico. The local chapter needed a means to build support for a ranked choice voting ballot measure. DemLabs trained the local FairVote team on how to use Flipgrid in about 3 hours. The team then used it to collect video clips from residents on their own and create a Facebook campaign for their ballot measure that got over 6,000 views! As we trained other progressive groups such as NDCO on using Flipgrid, we noticed that many people were reluctant to record a video even though it was simple task. We found that more videos could be collected if a trusted source (such as a pastor, canvasser or journalist) requested a recording. 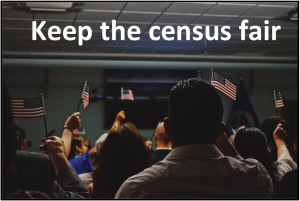 Ethnic Media Services used this approach effectively by having journalists ask their readers to record why they felt that the citizenship question should not be in the 2020 Census. The videos collected were edited in-house with iMovie to produce a social media campaign to accurately count ethnic minorities. Make your appeal easy to understand with graphics and maps. People Demanding Action (PDAction) had an interesting storytelling request. They wanted to highlight how African American seniors in Virginia were being disenfranchised as polling places were being moved further from their retirement homes. DemLabs searched for affordable apps that could make their case with graphics and maps. We chose StoryMaps.This storytelling platform makes it easy to create compelling ‘stories’ that combine graphics, videos and maps. Storymaps can be shared by email, Twitter, Facebook, Instagram and embedded in websites. 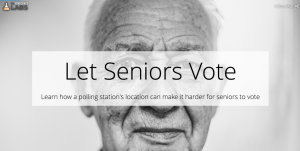 PDAction used Storymaps to craft a powerful appeal for better access to voting locations for African American seniors in Virginia. Storymaps are useful in campaigns too. 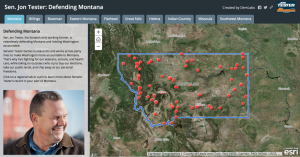 The Jon Tester campaign designed a StoryMap for the midterms to highlight the Senator’s accomplishments in Montana. Challengers use the technique differently in their campaigns. They present an interactive map with images collected by their supporters of all the things in their district that could be improved such as schools, roads and hospitals. Reach a bigger audience by working with the news cycle to get free exposure. A story is only as good as the number of people it reaches. The next challenge was to get more distribution for StoryMaps without paying for advertising. News cycles get faster and attention spans get shorter. How can a story get heard in such an environment? Testing showed that the best approach was to work with the news cycle to get free exposure for stories. Women’s Voices, Women Vote Action Fund (WVWV) used this approach with with their StoryMap that encouraged votes for Pro Choice candidates. 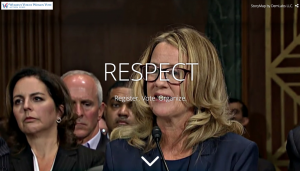 It was timed for released during the Kavanaugh hearings and was featured in Newsweek generating more exposure. DemLabs refined this approach of working with the news cycle during the midterms with “See Something, Say Something”. 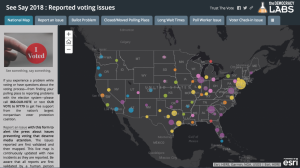 This storymap was designed with Win The Future (WTF) to let voters immediately report obstacles they encountered while trying to vote. Samantha Bee shared the real-time dashboard of voter harassment with her followers. The dashboard has had over 250,000 views and collected a database of over 1,100 incidents. (Tip: Work with partners to amplify your message. Rock The Vote, Democrats.com, OSET Institute, Center for Common Ground and Voter Participation Center supported this project). Digital stories have to be short and engaging to get attention. We started adding rich media such as videos (from YouTube and Vimeo), maps and sounds to StoryMaps. Our next innovation was to combine video clips collected with FlipGrid, into a StoryMap followed by timing its release to correspond with the headline of the day. We tried this approach with Ethnic Media Services who collected videos and created a montage of messages from people in favor of a fair 2020 Census. 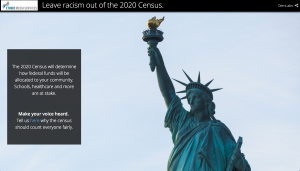 This montage was combined with a public video of Rep.Steve King’s (R-IA) racist comments in order to make an appeal to keep racism out of the 2020 Census. Training is essential to spread the adoption of new solutions. Groups can run better campaigns on their own for less money. 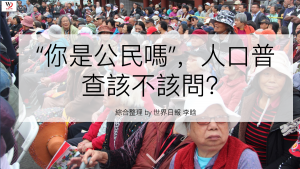 The value of training was demonstrated recently by a writer with World Journal who after being trained by DemLabs and Ethnic Media Services, created thisStoryMap about the 2020 Census in Chinese by himself. 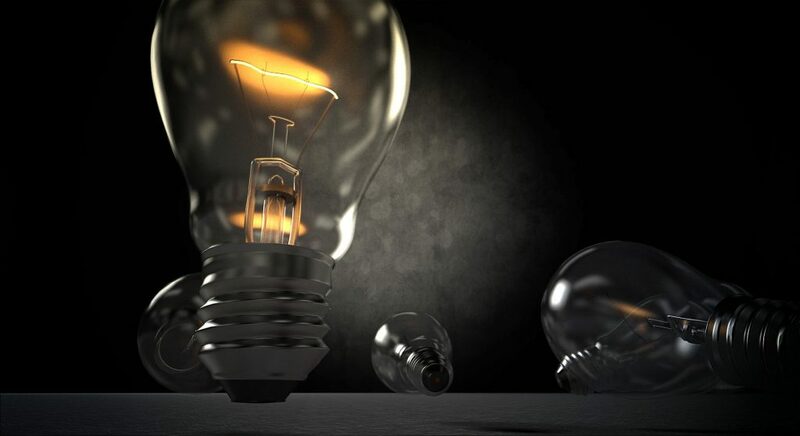 Innovation upsets the status quo. Sales are threatened by better solutions that cost less. Consulting fees shrink when an app is easy enough to be use without help. Ten years ago, businesses bought expensive computers and hired programmers to run them. Big corporations had an advantage over startups because they could afford more computing. Amazon changed all that. It rents as much computing power as you need at a fraction of traditional prices so more startups can launch with little funding. A similar shift is needed in politics so a lack of funds and tech savvy aren't barriers to running a good campaign. Campaigns have to be informed of new innovations that can lower their costs and help them win. DemLabs tests new apps and freely shares its findings through a blog, online webinars and in-person workshops. DemLabs neither sells software nor accepts fees from vendors in order to provide unbiased recommendations. Contact us with challenges that could use some innovation, and when solved also help other progressive campaigns. A Digital Storytelling workshop is planned in Washington, D.C. on for Feb 22. Experts will review the storytelling projects above and the apps used to create them. The workshop is free, but space is limited. RSVP here.